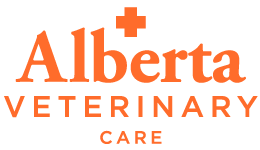 Alberta Veterinary Care has a new Co2 laser! We now utilize laser surgery (Co2 laser) whenever possible. A laser is a device that produces an extremely powerful and concentrated beam of light. Unlike traditional surgery with a scalpel or scissors which can bruise or crush tissue, only the laser light beam touches the tissue. The laser seals small blood vessels as it cuts, which significantly simplifies the surgical procedure. The laser ablation is so precise that it can selectively remove only a few cells at a time, and the laser beam seals small blood cells and nerve endings as it cuts, so patients are much more comfortable after treatment. The laser beam kills any bacteria in its path, and also seals lymph nodes, resulting in less post-operative swelling and infection. Laser surgery provides the same benefits to pets as human patients: less pain, less bleeding, less infection, less swelling and less discomfort after surgery. Your pet will have the ability to resume normal activities sooner. Laser surgery shortens some surgical procedures, reducing the time a pet is under general anesthesia. Laser surgery can be utilized in a variety of procedures. We will discuss whether your pet will benefit from laser surgery when discussing your pet’s surgical procedure with you.